Masaaki Inoue has been visiting Tokyo’s Yasukuni Shrine for decades. The 63-year-old’s father, who passed away five years ago, was a survivor of the Battle of Imphal, the bloody fight between the Imperial Japanese Army and the Allied forces considered one of the great turning points of the war. For Inoue, his annual visit on the Aug. 15 anniversary of Japan’s surrender in World War II is to honor his father’s fallen comrades that are among the 2.46 million war dead commemorated at the shrine. But he says this tradition is unlikely to be handed down to his children. “For them, it’s the distant past — stories about the war for them is like something from a movie,” he said. 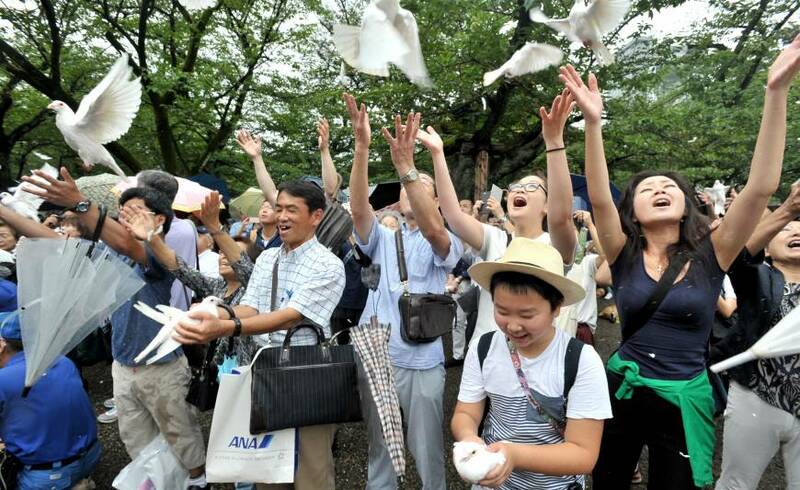 Inoue’s sentiment was echoed by some young Japanese interviewed by The Japan Times, who said the historical significance of Aug. 15 or the political tensions surrounding the shrine are subjects seldom discussed. Keigo Furukawa, a 19-year-old student attending a university in Tokyo, said he learned about Japan’s wartime history at the public schools he attended, but said courses traced over the period without delving too deeply into detail. He said Japan’s role in the war, or its consequences, rarely come up in conversations among friends. “And my parents were born after the war, so the topic doesn’t really come up at home as well,” he said. Inoue was among the crowd of people visiting Yasukuni on Tuesday, the 72nd anniversary of the end of World War II. In what has become a common scene every year, ranks of police officers lined the street leading up to the shrine as right-wingers driving black vans emblazoned with nationalist slogans cruised nearby roads. 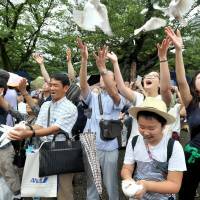 Activists from across Japan’s political spectrum handed out leaflets to visitors while reporters gathered near the shrine to monitor which politicians showed up to pay their respects. Because it enshrines 12 convicted Class-A war criminals and another two suspects who died before their rulings were handed down at the postwar International Military Tribunal for the Far East, Yasukuni is a source of friction between Japan and neighbors China and South Korea, which considers the shrine a symbol of Japan’s militarist past. Visits to the shrine by Japanese lawmakers, and especially prime ministers and Cabinet members, have drawn scathing condemnations from Beijing and Seoul. However, such controversy appears to be a distant topic for many young people. A survey of 1,200 peopled aged 18 and 19 by public broadcaster NHK between June 21 to July 25 showed that among the 503 respondents, 14 percent said they did not know that Aug. 15 was the day Japan surrendered. Analyzing the results of the survey, Tsuyoshi Fujii, a professor at Meiji University, told NHK that the figures could reflect how some history courses in middle and high schools do not cover the war. Masaki Nemoto, a 20-year-old university student, said he visited Hiroshima when he was in middle school and learned about the atomic bombing as part of a peace education program initiated by his city. He said, however, that Japan’s surrender or the significance of Yasukuni are not topics he and his peers talk about often. “I don’t think people are really conscious about these things, unless we see it on the news,” he said. Riki Miyasato, a 21-year-old university student from Nago, Okinawa, said he learned about the Battle of Okinawa through visits to the Peace Memorial Park in Itoman, Okinawa Prefecture, and from listening to stories of elders who experienced the fierce battle that raged across the Ryukyu Islands in 1945, prior to Japan’s surrender. However, Miyasato said he was unaware of the controversy surrounding Yasukuni Shrine. With the population of those who experienced the war — and relatives of the war-dead aging and their numbers dwindling — passing down memories of the war to younger generations is becoming increasingly difficult. Just six widows were at Tuesday’s state-sponsored ceremony, which Emperor Akihito and Empress Michiko also attended, at Tokyo’s Nippon Budokan hall. In 1998, a total of 954 widows were at the event. Inoue, whose father would have been 94 this year, said he often heard stories about the war when he was growing up, as some of his school teachers were former military officers. “I don’t think my children are really interested in why I visit the shrine,” he said.